Questions? Call 856-368-9085 Traditional Styling - Decorative wood accent moldings, recessed modesty panels, and decorative swinging bail hardware come togeather to create a rich traditional look. Function - All drawers are suspended on quality, metal ball bearing slides. File drawers are fully extending to allow easy access to the entire drawer. File drawers are equipped to accept front-to-back letter or side -to-side legal sized hanging file folders. All cases are equipped with levelers to adjust for less than even flooring. Computer applicable furniture features grommets or other openings that facilitate neat and easy management of computer cables. 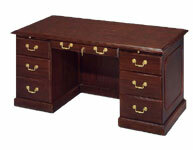 Convenient Working Area - Large writing surfaces allow plenty of room to spread out your work. 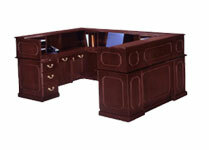 Desks include convenient pull-out writing boards for an expanded work surface. 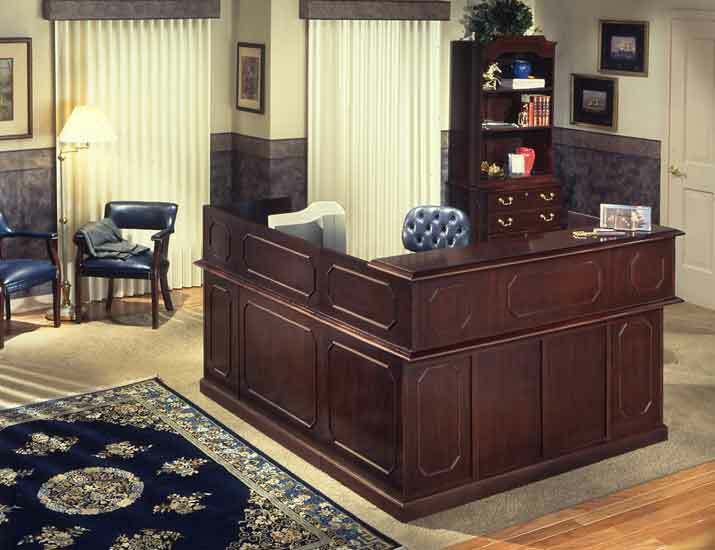 All executive desks feature quality engineered plunger, central locking system for added convenience. 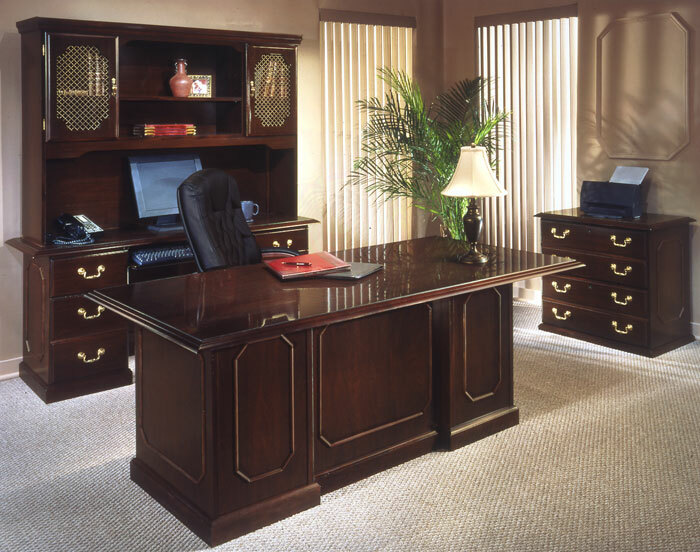 All file cabinets have individual file drawer locks for security and flexibility. 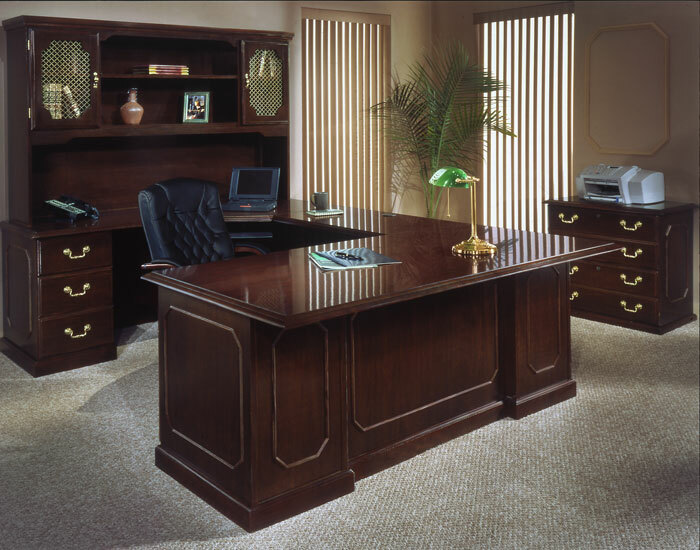 Construction - A richly engraved executive mahogany finish on a construction of wood, medium density fibreboard, veneer and other wood products. All top surfaces are high pressure laminate to help protect work surfaces against scuffs, stains and moderate heat. All other exposed surfaces are protected bt DMI's multi-step Top Guard� finishing process to guard against stains and scratches from everyday use. 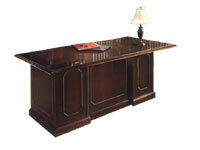 Pull-out writing board, box/file drawer per pedestal. Center drawer with central locking. Drawers suspended on metal drawer slides. Fully extending file drawers. Felt lined center drawer with a pencil tray. Box/file drawer per pedestal. Drawers suspended on quality metal slides. Fully extending file drawers. Storage compartment has one shelf. Box/file drawer per pedestal. Pull-out keyboard drawer. Drawers suspended on quality metal slides. Fully extending file drawers. Cable access grommet. Box/file drawer left pedestal. Pull-out keyboard drawer. Tower CPU storage compartment in right pedestal. Cable access grommet. Box/file drawer per pedestal. Pull-out keyboard drawer. Fully extending file drawers. Cable accessible. Two adjustable shelves. Fits ontop the lateral file. cable access grommet. Two adjustable shelves; two stationery shelves. Cable access grommet. 20" vertical clearance available. 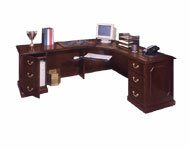 28.75" wide center, adjustable shelf. Two door compartments with antique wire mesh fronts; each with one adjustable shelf. 20" clearence to bottom edge of first shelf. Cable management grommet. Questions? 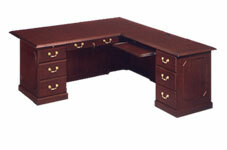 Call 856-368-9085 34.75" wide center, adjustable shelf. Two door compartments with antique wire mesh fronts; each with one adjustable shelf. 20" clearence to bottom edge of first shelf. Cable management grommet. Box/box/locking personal file drawer/locking lateral file drawer. Overhead storage: One stationery and one adjustable shelf. Cable access grommet. Computer desk: Pull-out keyboard tray. Tower CPU/storage compartment in pedestal. One utility drawer. Cable access. Rectangular Conference Table with Slab end Base Rectangular high pressure laminate top with wood veneer edge. Slab end base. 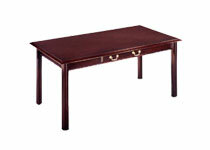 Rectangular Conference Table with Queen Anne Bases Rectangular high pressure laminate top with wood veneer edge. 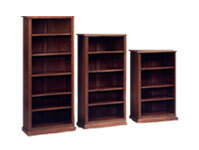 Solid wood Queen Anne bases.